Given that legendary football boss Alex Ferguson cut his managerial teeth at Aberdeen there's something fitting about his poker playing namesake winning a first big tournament in the same city. Alex Ferguson the poker player has won the latest leg of the Grosvenor 25/25 Series and with it a career best score of £10,800. The Aberdeen native's previous best was a runner-up finish in the 2011 Scottish Poker Championship in Edinburgh. He's also gone close in a number of UKIPT side events but never quite managed to seal the deal. Until now that is. Ferguson topped another guarantee busting 25/25 field at the Grosvenor Casino in Aberdeen. 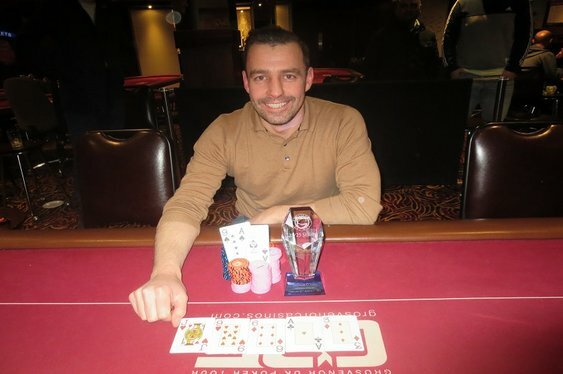 After Mindaugas Kriauciunas exited in fourth place, the final trio of Ferguson, Simon Yates and Steven Raffan agreed a three-way chop before playing on for an extra £800 on top, the trophy and the all-important first place tag on the Hendon Mob. After Raffan lost a flip to Yates, it was down to two and Ferguson would not be denied. The chips hit the middle on a 6-9-J-A board with Ferguson well in front holding A-9. He would have a sweat though as Yates tabled 7-8 for an open ender. The river was a harmless 3 which gave Ferguson the win and with it his best live tournament score. Next on the 25/25 agenda is a leg in Plymouth starting on Thursday. There's another £25k guaranteed at the city's Grosvenor Casino with the first of three opening flights starting at 7pm on Thursday with further day 1s at 7pm on Friday and 4pm on Saturday. Online satellites take place at Grosvenor Poker tonight and on Wednesday night if you fancy trying to qualify on the cheap. The next GUKPT festival in Manchester is rapidly approaching too. The eight-day festival at Bury New Road starts on Sunday 8 March with the £1,000 Main Event action getting under way on Thursday 12 and Friday 13 March. Qualify online at Grosvenor Poker. Image courtesy of ScottishPoker.net / Grosvenor 25/25 Facebook page.